PETER CHERRIE insists there’ll be no handshakes or pleasantries ahead of Derry City’s clash with Cork City at Turner’s Cross tonight as he returns to his old stomping ground intent on causing an upset. The experienced goalkeeper made just seven appearances for the Rebels during his season long spell at the Cross with Mark McNulty being Cork boss, John Caulfield’s preferred choice. 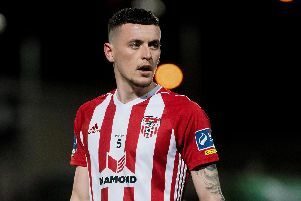 He was delighted to receive a phone call from Derry manager, Declan Devine during the close season with the offer to become the Candy Stripes’ established No. 1 for the 2019 campaign. The Scotsman has made an encouraging start to his City career with several terrific saves at both Shamrock Rovers and Waterford and is loving life on Foyleside. And he’s relishing a return to Leeside tonight to show Caulfield he was wrong to let him leave. “These things happen in football,” he said. “It will be good to see familiar faces but at the end of the day we’ve a job to do. We’re going down there to win. We will shake hands after the game but before the game there’ll be no shaking hands,” he smiled. It was a frustrating season last year at Cork for Cherrie given his limited game-time but he accepts it was always going to be difficult to compete with McNulty for the No. 1 jersey. “Cork is a great club with great people,” he said. “I didn’t get as much game time as I would’ve wanted but these things happen. You’ve got to bite the bullet and keep working. “It’s a club everyone wants to be at, like Derry. I’ve been there and know what they will be like. They will be dogged, hard to break down. It’s about us being confident on the ball. It’s a new Derry team and no one knows much about us and it’s time to go and show them. “There were days down there when you’re doubting yourself, asking what was going on, why wasn’t I playing. And to be fair, Mark McNulty, who I get on well with and still do, he was always there behind me and he’s an experienced keeper as well and has done it all. “People were saying it was the league’s two best keepers at the one club and it’s probably hard to manage because the two want to play. You just have to work hard everyday and get on with it. But thankfully I got the call from Declan. “Coming up here when I first met Declan it was a no-brainer for me to sign. I genuinely love it here. My wife loves coming up here to the games and it’s just a happy place to be. Cherrie knows all about Turner’s Cross and how difficult a venue it can be for visiting teams but he believes this Derry team will relish playing in front of a large support. “The boys are flying and it’s all about confidence,” he said. “They’re high in energy and I hope we can take that with us to Cork. You can see at training there’s a great buzz and a feel-good factor and the boys are enjoying themselves. “They just have to go and express themselves in a great stadium, a packed house at one of the big clubs in Ireland so it will be a test.